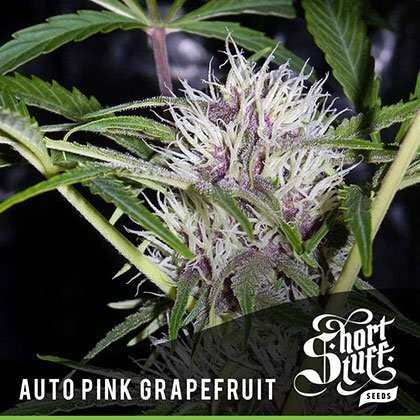 Buy ShortStuff Auto Pink Grapefruit seeds from dope-seeds.com now! As you would expect from this strain the flavour of the smoke is sweet and fruity but you can also find some hints of pepper and spice as well. The effect is nicely balanced, euphoric as it first hits, with an intense body stone to follow. The narcotic properties of this strain make it a great night-time medicine for those looking for a sleep aid and some pain relief. Auto Pink Grapefruit is part of our Boutique Line of cutting edge Autoflowering cannabis genetics. The Boutique Line contains the most up to date autoflowering genetics which are pushing the boundaries of what can be done with autos. All the strains in the Boutique Line are big, tall, heavy-yielders and have been produced in-house by Shortstuffs master breeders.